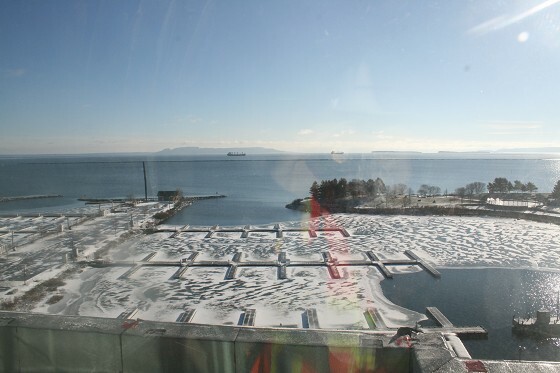 Vue on the Water Condominium Project Is A Great Success for Thunder Bay! The Vue on the Water condominium project was first announced with an official signing ceremony between the City of Thunder bay and the Re Solve Group Inc several years ago. This private sector development on the Thunder Bay Prince Arthurs Landing Waterfront created a lot of excitement. The project would include two 51-unit luxury condominium buildings and a 4 stars plus Delta Hotel. Today in November 2014 after an 18 month construction period the first condominium has many residents moved in and will be fully occupied by December 15th! I sat down recently with Gisele MacDonald , President of Re Solve Group and developer for Vue on the Water. How has the project gone Gisele?
" This project has been a tremendous success. We are extremely pleased with the overwhelming acceptance of this project in Thunder Bay. The community has welcomed us with open arms. I think the project is everything and more than what they expected it to be." You now have people moved in and enjoying the waterfront condo living experience!
" We are very excited with over 20 people in and by December 15th the entire building will be moved in, which is 51 units. There is one unit left in building one and four units in building two, so five units left. Are you happy with the final Vue on the Water product?
" This has been an incredible vision for me-everything I expected and more. The city administration has done an excellent job in master planning it and we have really stuck with this master plan and tried to make it better. We, as the developer, have put an extra $ 1million into the building and did not pass those costs on. We have larger windows, granite and different upgrades we put into the building such as the acoustics and treatments to the windows. People will move in April to the second condo building." How are you progressing with the new 5 Star Delta Hotel, which will join the development?
" We have over $3 million in the ground invested in the hotel already. It is finished off to elevation 100 and the structure of the hotel will be starting at the end of February or early March and will be completed the end of March 2016. The Delta Hotel will be a four star plus. We have completed the drawing and have the rendering displayed on site. We are looking forward to bringing this hotel to Thunder Bay that actually nobody thought was going to happen." I sat down with Peter Belluz, President of Manshield NWO Construction to talk about this complex construction project has progressed? 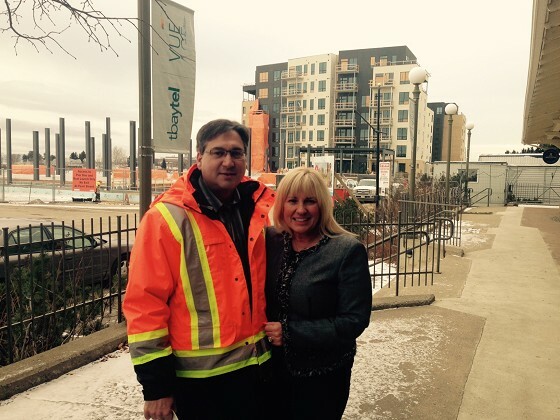 Did the waterfront site pose any challenges for construction?
" The land we used was partially on the reclaimed land and partially on the existing parking lot. This created a major part of the job as there were over 1000 piles put in place per building and a large concrete job, which Manshield did with our own forces." " The foundation work on the Vue Condominium and Delta Hotel development was started in the spring of 2013 for a construction period of 18 months to have occupancy in the first building. The foundation took 6 months to complete and we have been working on the superstructure for about 1 year. The foundation work and underground garage is one of the largest garages in Thunder Bay. It is 300 meters long, the equivalent of 3 football fields." The construction of the condominium buildings was done using a unique system?
" A specialty sub contractor in Toronto fabricated all the exterior walls and the load bearing panels off site. It is a very efficient system and lightweight so the irregular shape of the condominium building over the garage lends itself to that type of building system. The garage is a large rectangle shaped structure with two triangular condominium buildings on top so you are looking for the lightest but strongest building system possible using heavy gauge steel studs. Masonry and precast would have been too heavy to accomplish the design. We had done the Roseview Manor on Shuniah Street in a similar way with the erecting of the floors. " windows which is a real high-end finish." " The Delta Hotel will have the two first floors as an conventional structural steel similar to other projects. The first two floors are common areas and have large spans involved which require steel. The super structure will be that panelized heavy gauge metal studs for the rooms of the hotel." These major buildings have gone up quite quickly?
" In late October 2013 we started erecting the first building and have just moved people in early November. We had a compressed schedule as the developer wanted to move people in before Christmas as many are traveling south on vacation in the New Year. We worked pretty hard to make the schedule and at one point had over 200 workers on the site." Sales have been good and that is one of the reasons why we able to start the second phase so quickly. There are few units left for sale in both buildings." How is the second condominium building construction progressing?
" The second phase is all enclosed and we are finishing off the final details on the exterior along with the insulation. We expect to have our drywall boarding going ahead full steam in December and are looking at completing by March with April move ins." " The most challenge part of the project was working with each individual purchaser with their own customization to the suite with many changes. Instead of ordering 52 of the same tubs we ordered 20 of the same and 30 other types according to their wishes. It took a lot of coordination to get the right fixtures plumbing etc. It has been a successful project." When will you resume construction of the Delta Hotel?
" We will start again in the spring on the Delta change hotel and it will open in the spring of 2016.The amenity space of the Delta will be quite nice and that is the design that is in progress right now. The suites and rooms will be a little simpler because there will be only a few variations versus so many on the condos." How did the work go with so many sub trades on the project?
" The sub trades performed well. We had had a great electrical contractor- Grant Electric and Thermal Mechanical really pulled through with mechanical." " The unusual aspect of the project has been in the co-ordination of the customization of each suite. Virtually each suite has a different kitchen, different flooring and paint colours, different fixtures and sometimes even a different layout, which resulted in mechanical and electrical changes. Manshield co-coordinated, with our own staff, all of the different fixture counts and schedules for the sub trades to use to co-ordinate their work. Manshield also performed all of the finish carpentry installations including kitchens, doors and trim, washroom specialties, appliance installations, closet organizers and all of the other detailed work required to complete the homes." " We see a good promising market in Thunder Bay in the next few years."